Fincas in Tenerife for farming, holidays, rental, events, excursions, property investment and much more. 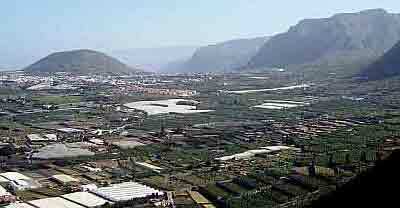 Fincas in Tenerife are not only farmsteadt for crops, livestock, fruit and vegetables. Encounter Fincas with spas for wellness holidays or with their own walking and hiking clubs. 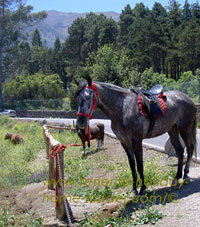 Tenerife isn't a horse country but, horses and riding farms exist. By far, discover some of most picturesque fincas in Tenerife above la Orotava on the way to Teide. Click to enlarge the horse finca country photo. Make out a paddock with horses. Spot others where your adrenalin may peak. Look out for farms which offer not only seminars but classes for art, philosophy, music, pony or camel riding, cooking, you name it. There may be new ones, all the time. Never, if you pick the right one. But this article is also informing on historical fincas and museum farms. Besides, it gives the property investor an idea what others have done in this field. What do rural fincas look like by the sea? Fincas in Tenerife by the sea are often big. The ones shown here have large shade houses. Mind Los Silos and Buenavista Fincas of the fertile Isla Baja the valley that is by the oldest Tenerife Westcoast mountains a district that stretches right down to the sea, just like the Buenavista del Norte golf course. Note that the upper Teno lands are mainly pastures for goats and sheep. This is above El Palmar and by Teno Alto. Fincas in the low lands of Buenavista and Los Silos the Tenerife town that was named after huge grain stores are used above all for bananas now. Also, tomato shade house cultivation is very popular there which includes South Tenerife. Tomatoes don't do well in the North of the island where the slopes above la Orotava bring much moisture in late afternoons. However, any special fruit that hasn't been imported, such as figs or even Kiwis in season always come from from Buenavisto del Norte's Isla Baja.That's what fruit shop owners in Tenerife told me. Amazing is how those fincas/farmsteads with all their agriculture get water. Tenerife fincas can't feed of rivers. Lakes don't exist either on the island. However, springs bring water in pipes to Southern fincas from the mountains above. However, you see little planted in the so called windmill country of the Island along the coastal freeway where water is scarce. By the way, most southern beaches of Tenerife without adjoining fincas are in the Southwestern region of the island. Icod de los Vinos the vineyard region near Buenavista is found much higher up and it's amazingly green and fertile. Study the locations were to find most quaint Icod de los Vinos fincas by double clicking on the island maps. Tierra de Trigo (wheat) potatoes, vegetables and wine at Icod of Los Realejos. Hacienda la Gorvorana, which is now a Historic Realejos issue was once used for cane and later banana cultivation. This much more famous farm was half an hour by horse from La Gorvorana in Los Realejos Bajo. This was the first of all fincas in Tenerife. It was the Hacienda finca Tenerife de los Principes. Initially, it belonged to the Adelentado de Lugo the conqueror of the island. Finca la Pared 'Halfway House' Icod Alto of Potato history This is another of the island's former very important fincas. Hear more about it by its history of potatoes which probably indirectly introduced the crop to the whole of Europe. The Tenerife fish farm Aguamansa isn't really seen has one of Tenerife fincas but rather as a scientific environmental project which is called Piscifactoria in Spanish. Want to eat farm food like rabbit or fresh trout? Just before the trout farm encounter a small farmstead with a paddock, the photo of which was shown above. Finca Aguamansa has been a halfway house for farm folk from upper la Orotava for a long time. Farmers stop by with their horses. Known to expats as the Tenerife trout restaurant the Restaurant Aguamansa has been serving this fish and other home made Canary cuisine since about 1970. Learn why this potato finca which was a renovator's dream with stunning view may have caused problems, although an excellent Tenerife property investment. Never mind its heavenly lemons on trees. Banana plantations with fincas are on the west coast right down to Los Silos of Isla Baja, mainly. A banana finca (banana plantation) in the middle of Puerto de la Cruz is not rare. There is a large one next to Loro Park a former big farm opposite the prime beach Playa Jardin which was already a winter resort of Tenerife natives before the conquest. This finca plantation is so big. One hardly sees the farmhouse on top. You can't but miss the exotic banana patches while on a Titsa bus in the north or when walking. They give most stunning breaks to urban landscapes in the north, such as in Puerto de la Cruz or Los Realejos. One of town banana fincas. Spot it beside the resort Bahia Playa and opposite the Tenerife hanging gardens of Puerto de la Cruz. This presents a different charm than the coastal splendor of a banana plantation. of Rambla del Mar. Another large banana farm has a beautiful coastal walking trail to Bollulo beach and is by Puerto de la Cruz La Paz which leads to incredibly beautiful paradise country by the wild beaches near Puerto de la Cruz which are in the exotic banana region of La Orotava. The Country hotel Finca Salamanca is ideal for large wedding parties and similar large celebrations, seminars and the like. I was under the impression that only rural hotels owned by the government called Paradores existed. The only hotel in the Teide National Park Parador del Teide is such a hotel. You may do your own excursions to the highest peak of Spain to get there, even by bus. 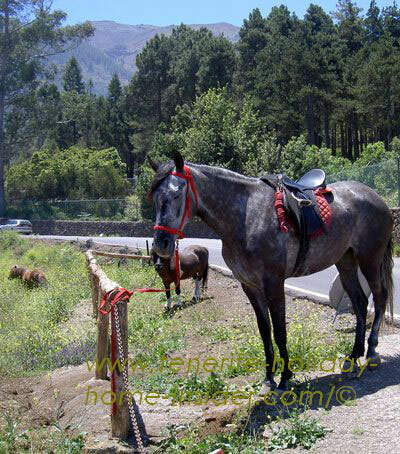 There are many smaller theme fincas in Tenerife which are often advertised as rural houses for sale. Enterprising investors turn them, later, into small country hotels for theme holidays, such as for birding. Their accommodation bookings for holiday home in Tenerife rental can often be done in the Internet. 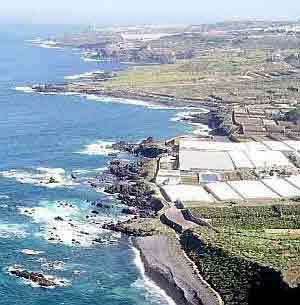 Most of those fincas are in the north of the island close to many walking trails by the oldest Tenerife resort. Teno Alto natural stone house finca. Many a humble, rustic stone house is amongst Teno Alto fincas in the highlands beyond Monte del Agua in goat cheese and sheep country above el Palmar. There, walk along dainty, medicinal herbs by the way side, along caves and through crevices with views for ever. There, encounter fincas with special enclosures. They are walled in small round terrains with paved ground which adjoin a farmstead. They are serving for crushing wheet and fudder for horses without machines by old customs. Natural stone walls as well as huge borders made with the Opuntia cactus ( prickley pear) to keep wind and weather at bay. This cactus whose fruit is edible also delivers ecological, purple dye from its lice parasites.. Indeed, one of the fincas has a bar with a shop. 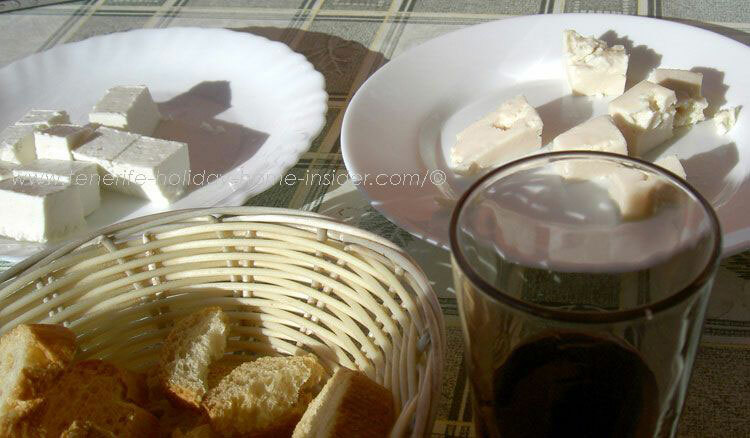 Sit outside beside pot plants on its porch with a good red wine and enjoy some goat cheese. Have it fresh or more mature or both according to taste. Get there from Buenavista on the TF436. Holiday letting is totally legal, with rural fincas which have a license to let to tourists, although it's done with other properties, too. rural setting with 4 houses. Painting and drawing classes are offered. It doesn't only have a beautiful flower garden. Bio vegetables are also grown. Please, note that the British Bed and Breakfast accommodation is rare in Tenerife, by the way, except in hotels, of course. Why is that so? Even tourists renting fincas in Tenerife or within rural houses often do like the Spaniards do and have a cheap snack or breakfast in a café or bar. Nevertheless, a traditional English breakfast would be appreciated by British guests. Some old fincas in Tenerife serve as museums like Finca de Rambla by the coastal nature reserve of San Pedro which is being renovated. The nature reserve is part of the Rambla de Castro which is the most romantic coastal Tenerife hiking trail in the north for more gentle walks past a a ruin with a legend with exotic looking banana fincas nearby. Please, go from fincas in Tenerife to finca El Meson Monasterio Montañeta, which is a theme park attraction with restaurants, orchards and some typical finca farm animals below a nature reserve which stretches about 400m up a peculiar round hill. A 5-10 minutes car ride from Monasterio brings you to a very unusual, stylish farmstead of the XVIIIth century. Discover the Finca Villa Abaco Museum for events which ads even more to the culture of Tenerife North. Tel: +34 922374811. Finca Casa Baranda (Casa del Vino) Tel: +34 922 572535 fax: +34 922 572744, is another lovingly renovated farmstead. It is an interesting wine museum with restaurant in Tenerife North. Casa del Patio an icon of Tenerife feudal times is one of ancient manor fincas which is now a hotel, museum and country estate for horse riding and relaxing away from it all. There was an interesting one with constant art exhibitions and live music events by Arona until its owner died in 2012. Now it's an outdoors bar grill restaurant at Chayofa for the crowds where table barbecues may leave more privacy. Finca del Arte is situated in a rural area 20 minutes from my friend's direct sale property Los Gigantes. The exhibitions by Finca del Arte are good. Also visit the art village ArtLandya Finca with doll museum and teddy museum of Icod de los Vinos. This is a totally restored farmstead of fincas in Tenerife which has perfect surroundings for relaxing as well as meditation, while you also may exhibit there. Fincas in Tenerife are indeed a big feature on the island whose main business is agriculture or tourism besides its Free Port and are therefor returning in many topics. Some renovation regulations for fincas/farmsteads/country estates apply by law but, may vary from county to county. A finca/ country villa renovation review. From fincas in Tenerife back to real estate in Tenerife guide and glossary with important links. The meaning of a Finca explained in Spanish, here, as it isn't a British term. There's no equivalent in the UK or English speaking world.